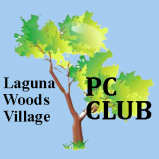 The Laguna Woods Village PC Club is a 501(c)(3) non-profit organization dedicated to maintaining Laguna Woods Village's PC facilities and providing helpful services and learning opportunities to all residents. All functions in the PC facilities are managed and executed by volunteer members, and the facilities are funded jointly by Laguna Woods Village and the PC Club. Laguna Woods Village Community Center, 24351 El Toro Road, Laguna Woods, California. All functions in the PC facilities are for Laguna Woods Village Residents and their guests only. ​ Your PC Club is a non-profit organization, dedicated to helping residents improve their computer skills and get more enjoyment from their computers. Section 501(c) (3), Tax ID 42-1645625. The Laguna Woods Village PC Club maintains Laguna Woods Village's PC facilities and providing helpful services and learning opportunities to all residents. The PC facilities are managed and executed by volunteer members. The facilities are funded jointly by Laguna Woods Village and the PC Club.The PC Workshop and the Learning Center are located on the third floor of the Laguna Woods Village Community Center, 24351 El Toro Road, Laguna Woods, California.